A truly special and unique anniversary gift for a husband or wife! 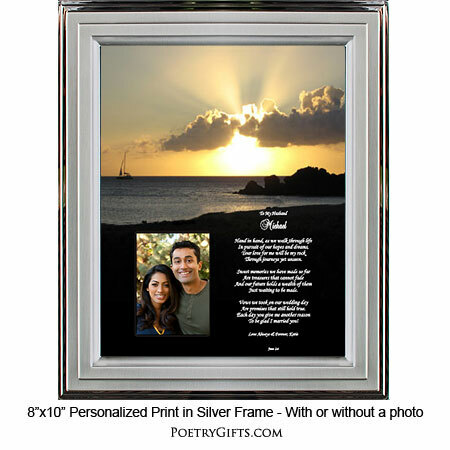 This original love poem presented in a romantic sunset design is ready to be personalized with your names, anniversary date, and a personal message. Add a picture of you and your spouse to make this an anniversary keepsake to cherish. Searching for a beautiful and lasting anniversary gift for your spouse? You just found it! What says "I Love You" more than a romantic poem that can be personalized with your names and anniversary date. You can frame this sunset print in your favorite 8" x 10" standard picture frame ($19.95 is the unframed price). 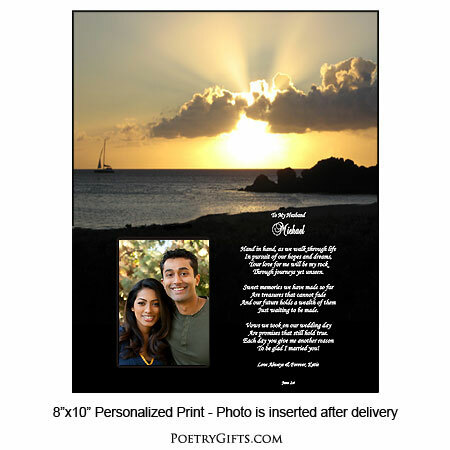 When you want to express what's in your heart on your anniversary, let this personalized Poetry Gift let the "love of your life" know how much you care. 3. Closing Phrase and Your Name (as seen after poem) - (Examples: Love Always & Forever, Ron; All My Love, Cindy; etc.)" just waiting to be made. are promises that still hold true. to be glad I married you! I have been buying from this company each of the past 12 years. My wife enjoys her yearly gift on our anniversary. It has become a part of the tradition. My wife cried when I gave her this...it really touched her. Will order again from this site. We understand that some of our customers enjoy writing their own poetry. 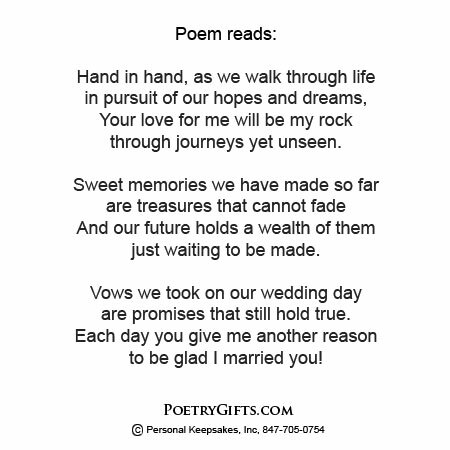 If you would like to express your feelings in your own words and in your own style about someone dear to you, we will be happy to design it in one of our Poetry Gifts. Click on the link if you would like to create your own Poetry Gift in this design. 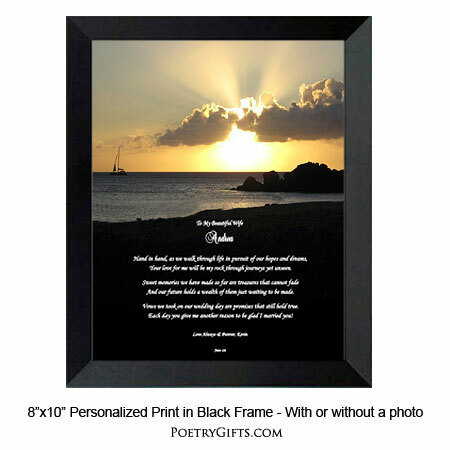 Or if you want to shop around for a different design or if you want to frame a poem go to our Design Your Own Poem category.